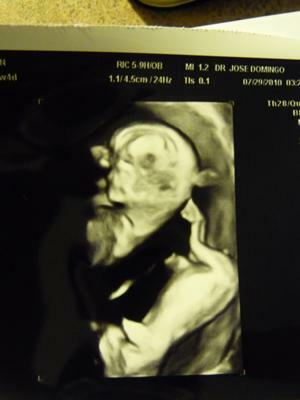 This is at 10 1/2 weeks, a 3D scan. We actually found out at our 6 1/2 appt that it was twins bc thats how my doctor confirms the pregnancy.. but this one really shows them much better!! Baby A's head and Baby B's body :) (Baby B was moving a lot though so its slightly skewed) The doctor thinks they are identical because he couldn't see a dividing membrane clearly, but we'll find out for sure at the next ultrasound at 18 weeks, also when we'll find out the sexes. My dad is an identical twin so I guess we shouldn't be too surprised! !